Both the Under 21 Women's and Men's Singles categories commenced on Wednesday 9th November at the 2016 ITTF World Tour Hybiome Austrian Open. A strong set of results for Russia's youth has boosted its contestants' chances of moving past the Under 21 Women's Singles qualifying group stage, while Danish fans had plenty to cheer about in the Under 21 Men's Singles event. Four Russians currently occupy first place in their respective qualifying groups, following a positive day of Table Tennis for the country in the category. Ekaterina Guseva (RUS) is top of group 10 after she won both of her opening day matches. First up for Guseva was a 3-0 win over the host nation’s Anna Maria Vouk, but a much closer encounter with Dragana Vignjevic (SRB) saw Guseva require the seventh game to pull the victory out of the bag. Daria Chernova was another one of Russia’s players to hold top spot after day one, claiming comfortable wins against Sophia Kellermann (AUT) and Alicia Cote (CAN) in group 16. Anastasia Kolish (RUS) and Valeria Shcherbatykh (RUS) also lead in the group stage. The Czech Republic’s Kristyna Stefcova and Katerina Tomanovska also managed to make strong starts at the Open as both players were undefeated, while Belgium has three representatives well positioned to qualify for the main draw: Lisa Lung, Izabela Lupulesku and Eline Loyen. 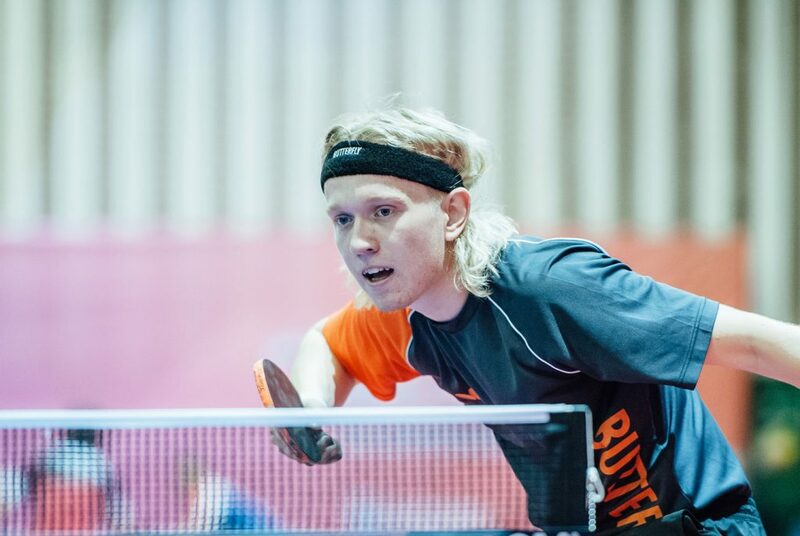 Denmark had three players battling it out in the Under 21 Men’s Singles qualifying groups, as Claus Nielsen and Anders Lind successfully secured safe passage to the main draw and Tobias Rasmussen moved into the preliminary Round of 32 having finished his group as runner up. Nielsen was drawn to participate in group 15 where he faced Andrej Kassay (SVK) and Alessandro Baciocchi (ITA); the encounter between Nielsen and Kassay didn’t take too long to see the Danish player find his way to victory registering a 3-0 win against the Slovakian, but Nielsen’s match with Baciocchi proved to be a much tighter affair which went down to the final game (12-10, 8-11, 11-6, 2-11, 11-7) before eventually going to the Dane. Group 20 saw Lind gather enough points to move beyond the qualification round, but competing in a group of four players Lind had to overcome Deni Kozul (SLO), Michael Trink (AUT) and Matthew Lehmann (CAN) on his path to the main competition. Some of the other contestants who automatically move through to the main draw having topped their respective groups are: Ng Pak Nam (HKG), Ioannis Sgouropoulos (GRE), Takuto Izumo (JPN) and David Serdaroglu (AUT).